Gosh in this generation of everyone doing this or doing that. Everyone seems to be achieving something or doing something great, being popular etc. It can be so hard to trust the process of God. I’ll try to be honest and open in this post. I have had so many moments of feeling behind. First I was feeling behind about ministry work. I have a glimpse of what God called me to do. But I was feeling behind about where I was in ministry. My sisters in my fellowship are such powerhouses carrying Christ. When they speak the heavens seem to open. They are living wholeheartedly for God, can quote the Bible, pray like the world is ending etc. And sometimes I would feel like I have wasted so much time and I should be on a higher level spiritually. In business, I remember the day God spoke to me about blogging. Gosh, I was so excited I told hubby about it and started. Somewhere along the line, I lost focus when i started comparing my life to others. I stopped being consistent and moved my focus because I felt this process God gave me was taking long and I could make it faster. I struggled, gosh I did, I tried so many things and they just never seemed to work. Others would do the same thing and succeed but for some reason, it was not the case for me. Then last year I took some time off to pray and seek his face. I wrote a post all about it HERE. Somehow he revealed a glimpse of what he had told me before and why I had to submit him. It is still a constant period of dying to self daily and letting his will take over. I HAVE INCLUDED AFFILIATE LINKS IN THIS POST. HAVE NO FEAR, THE PRICE OF EACH ITEM WILL BE THE SAME FOR YOU, BUT IF YOU SHOP THROUGH THE LINKS I INCLUDED FOR EACH ITEM, YOU WILL BE HELPING MAINTAIN THIS BLOG THROUGH A SMALL COMMISSION I RECEIVE OFF YOUR PURCHASE FROM THE STORES. THANK YOU! What do you do when you feel like you are behind and others are moving faster especially when you started together or are of similar ages? It may not look like what he told you that you will achieve but trust him. Do not try to rush the steps or skip some. He is the teacher and everything you go through he is aware of them. He knows that you need it to build a solid foundation for what he is about to place in your hands. Sometimes we think it’s too slow and come up with our own strategies to make it faster. If he put you somewhere it’s because there is something you need to learn. Don’t be in a hurry to become popular or well known or successful. It’s like running a marathon you cannot start out running at your fastest from the beginning. You will burn out fast and may not be able to finish or it will take you longer than if you had paced yourself. I ran a full marathon last year and didn’t practice enough. The longest I practiced was for 12 miles and the marathon was 26.1 miles. Needless to say, i struggled throughout. By mile 13 my left foot gave way and I was in so much pain I nearly gave up but pushed through it. It took me an hour longer than I had planned. Again lack of preparation made the process longer for me. I thought i could practice a little but fly through it. It is the same way with our spiritual lives, we breeze in and out of our time with God, yet we expect him to pour out his plans for us in those short moments. It will only take longer because eventually, you will realize you need to really spend time in his presence, not just a quick hello god here and there. Forget what others are doing. Don’t look at other areas and get more excited about that rather than what God is doing in your life. ” The need for significance makes us look at other areas that feel more exciting or not in line with our vision”. Maybe right now you do not have the grace for that thing that you think you are ready for. If he gives it to you now without you being ready, you might crash or get destroyed in the process. It’s just like a tree if you look into the ground the roots are so much bigger, longer and wider than the length of the tree itself. That’s because it needs to be strong enough to hold the tree. The same way our foundation needs to be strong to hold the vision he has for us. Don’t get more passionate about that dream or goal that you lose focus on Christ. This book called Rooted: The Hidden Places Where God Develops You explains it perfectly, we do not get to choose only electives on our journey through life. Think about it, you go to college and decide you will only take electives and skip the main courses because you do not like them or do not think they are relevant to what you want to do. Not possible Right? Sometimes we get so passionate about our purpose that we lose sight of who really matters. With my blog, sometimes, i get so carried away working on it, then get exhausted and overwhelmed. God did not create us to be too busy to spend time with him. He did not create us to carry our burdens by ourselves. You need to grow and be rooted privately first before he can grow you on the outside. Your private life with him should be stronger than your public life. So many people want to be a public success but do not want to spend time on their knees in the presence of God. We need to seek his face and invest our time in his presence each and every day. And not just by going in for quick give minute prayers, it needs to be an intentional time in his presence. Just like when you are getting to know someone you need to be intentional in spending time with them. It’s not by saying quick hellos here and there. One bible chapter he has been taking me through this year is John 15. I always somehow seem to fall back to this chapter. It talks about abiding in him and letting him prune me. This chapter is so deep. Many times we think we can succeed at this thing called Life on our own. But we forget we cannot achieve anything worthwhile without him, we cannot achieve his purpose without him. No matter how hard we work, it’s like a branch leaving the tree and thinking it can still bear fruits if it works extra hard. How many times do we say we will spend time with God and at the end of the day, we claim we were so busy? This happens to me often, i would do everything else but give excuses for him. I have been reading this book called Rooted by Banning Liebscher. The book talked about how God only reveals certain things to you in the secret place. 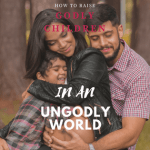 I also wrote a post about being a Godly woman. Thank you! Thank you for This! Hello! I cried reading this post. I read it because it was almost exactly the same title as one I published recently so I was just “perusing” it to see if I wanted to pin it for others…. and BAMMMMM it hit me over the head like a ton of bricks. I am struggling so much with this right now. Burning out from comparison and trying so hard… running that marathon at full speed like a crazy person. Literally less than 5 minutes ago I was in a semi heated debate with my husband over how often I should be going down to the church to pray and work (yes, I know I can pray from my house too – but it’s quite distracting with my barrage of little people swarming around – 4 under 6). I wanted to go only twice a week because I hate dealing with traffic (plus our road is under construction) and it takes me so long to get there. I thought I was wasting valuable time I could be working instead but my husband insisted I should also be using driving time to pray. I know he is right but I want to make excuses about how much I hate traffic, how it just makes me angry, and how much time I am losing of the already too few precious hours I have to work on His work. But when you said “You need to grow and be rooted privately first before he can grow you on the outside. Your private life with him should be stronger than your public life. … We need to seek his face and invest our time in his presence each and every day.” you SLEW all my excuses. 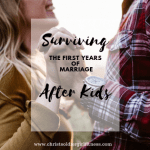 That horrible, awful, seemingly eternal time in the car during traffic is just for Him and me… It FORCES me to be unproductive with Him, to just be with Him and to not have that time be for anything or anyone else – not blogging, not ministry, not journaling, not jotting down notes…. JUST Him and me. That time is sacred. It’s like He WANTS me to be stuck in traffic just so He can force me to slow down and focus on HIM for a second and not just the work He is asking me to do. There will always be other time for that – He will make it happen if He truly wants it to – in His time and in His way. I’m sorry for the long and tearful rant…. but thank you, just thank you. I needed this. Thank you so much for reading and commenting!!! This totally made my day. Its so true, i hate the traffic but it really is a time we can spend with God, no one else and no blogging cause yea even at home there are so many distractions and its sometimes hard to focus on God alone. I am heading over to your blog right now, i am always looking for other awesome women of God like yourself! I tried to comment on your post about God being silent but couldn’t find it but i will share it, i also subscribed to your blog, thank you so much!! !